I wholeheartedly espouse those principles. Where do they come from? Not simply from a rational argument: rational arguments can be made for and against them and there is no proof. Some people appear to have no worth and dignity and I find good reasons every day for trashing the web of life for my personal gain (e.g., I don’t bother to approve or even know where much of my food comes from). Those principles come from a collective process of spiritual intuition and exchange engaged in by a whole denomination drawing on centuries of uninterrupted spiritual practice and development. They are among the most important things I know in my life and I hold them in common with many other people. I have spent years in a community that cohered around them, and around the daily practices of learning to live them together. They are provisional, in the sense that the process of drawing in more people, more experience, more honest sharing of spiritual intuition, in response to historical developments, may lead the denomination to change the wording or add another principle. How these principles are enacted in daily life is also subject to trial and error, group learning, prayer, meditation, heart–to–heart exchanges, small group process, exchanges with outsiders, and so on. Thus we build our spiritual knowledge. Rarely have I seen the importance of the Principles and Purposes presented so powerfully in a non-UU publication. It’s rare to see them defended so well in a UU publication for that matter. Belden really gives voice to the way I’d like to see our Principles and Purposes used in our congregations! I’m sitting in Terminal C of the Kansas City International Airport, waiting for my (just slightly) delayed flight back to the Twin Cities. Since KCI offers free wireless in its terminals (whoo-hoo! ), I thought I’d take a moment to upload some photos I took this morning while visiting the UU Fellowship in Manhattan, Kansas. I’ve saved 3 photos from the Konza Prairie Scenic Overlook on K-177, just south of Manhattan. It’s really quiet a view. And this morning was a perfect time to linger there on my way to the fellowship–sunny, breezy, not too warm. I have to confess that being able to spend time traveling was one of the original appeals of this job, and although I’m trying to keep my time away from the family to a manageable level, I still a pretty regularly thrilled by the differing landscapes I get to see as I roam the plains and prairie states of the district. The visit to the congregation was a success, too, and I’ll blog more about that later. So here’s the plan for getting a majority of religious educators in Prairie Star participating in the Reducing the Risk program in general, and the Safety Award in Reducing the Risk of Child Sexual Abuse in particular. The district has purchased 25 Reducing the Risk resource kits to distribute to PSD congregations at a considerable discount (the kits normally cost $50 plus shipping–PSD congregations can order them from the district for $25 plus $5 shipping). In addition to the kits themselves (a DVD set, a training manual, and reference book), the district will also pay the tuition for religious educators to take the online examination required to receive the Safety Award through the Institute of Church Safety. Completing the program does take an investment of time (I spent most of Wednesday reading the online sessions, taking self-evaluation quizzes and comprehensive reviews, and completing the 25 question final examination). But it’s an investment that’s well worth it. And since I’ve already completed the program, I’m ready to assist any PSD religious educator in the program. So, for $30 total Prairie Star religious educators receive the RTR resource kit, are eligible to enroll in the online seminars of the Institute of Church Safety, and are free to take the final examination needed to received the Safety Award. Again, the goal is to have at least half of the religious educators in Prairie Star trained in this program. For more information, send me an e-mail or call me at (612) 230-3274. It may not look like much, but it could be one of the most important documents a religious educator can have. 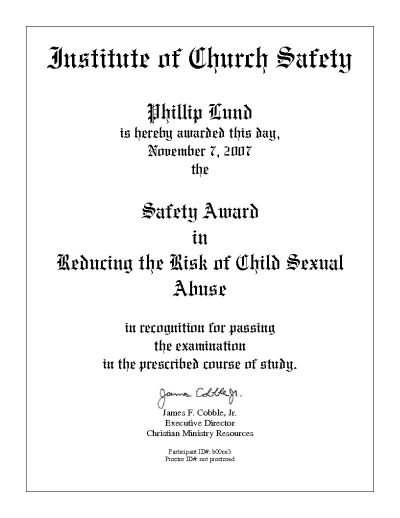 It’s the Safety Award in Reducing the Risk of Child Sexual Abuse from the Institute of Church Safety, an online training program from reducingtherisk.com. Child sexual abuse can happen in any church regardless of size, location, or affiliation. In this four-lesson seminar, we examine the nature and impact of child abuse, the profile of molesters, why churches are vulnerable, and the legal theories used to prove liability. This three-lesson seminar examines the unique vulnerability of churches to liability for acts of child sexual abuse. The first lesson highlights factors that make churches susceptible to incidents of child molestation. The second lesson looks at the current legal environment and reviews factors that contribute to church litigation. Lesson three examines the most common legal theories that are used to sue churches when child sexual molestation occurs within church settings. To ward off potential molesters, and to ensure adequate legal safeguards that rise to the level of reasonable care, every church should implement an effective screening program. This five-lesson seminar starts by reviewing the profiles of child molesters, and then examines the screening process for clergy and paid employees, the use of criminal records checks and other background checks, and concludes with developing an effective screening program for volunteer workers. This seminar begins by examining the profile of child sexual offenders. It then focuses on the problem of negligent supervision, and explains how key principles can be used to establish a basis for reasonable care. Attention is given to general versus specific supervision, and assessing levels of risk using the concepts of isolation, accountability, power, and activities. The seminar establishes five general principles of supervising children and youth to reduce the risk of child sexual molestation. At the conclusion of lesson 7 is a safety checklist that reviews the material for the entire seminar. This two-lesson seminar reviews legal obligations church staff members may have to report child abuse, and how a church can develop a reporting procedure. Attention is given to understanding the differences between mandatory and permissive reporters, when a report must be made, factors to consider in making a report, and establishing a reporting procedure for church workers. All churches and ministries need to focus on the prevention of child sexual abuse. Realistically no practical prevention strategy is 100 percent effective. An accusation of child sexual abuse may occur in any church. Churches need to develop a premeditated plan or strategy to respond to sexual abuse allegations. This seminar examines nine key issues that church leaders should consider in responding to an allegation of abuse. Tomorrow I’ll post more about Prairie Star’s plan to have a majority of the religious educators in the district be recipients of the Safety Award. I made a quick trip down to Cedar Rapids last Friday to meet with some of the religious educators there. Sherry Warren, our PSD Youth and Young Adult Specialist, happened to be in town for a Spirituality Development Training with the youth group from Peoples Church in Cedar Rapids, so she and Lori Allen (PSD Lifespan Faith Development program coordinator) and I were able to have a meeting before the, er, meeting. At any rate, it was great to see the folks in Iowa, and we had a good conversation about the future of Lifespan Faith Development in Prairie Star and in the UUA. I really enjoy getting together with religious educators around the district, so if you’re a DRE in a PSD congregation and would like an excuse to gather some nearby DREs and youth adviser for a weekday meeting, let me know and let’s see if we can arrange a visit! Most of these meetings include having lunch at the local church staffs’ favorite nearby restaurant. 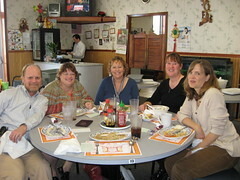 We decided to have ours at Phong Lan Vietnamese restaurant, which is just a couple of blocks from the church. I had the mixed vegetables–not bad. And thanks to Marlene Walker, interim minister at Peoples, for taking this picture of us.